Mundorf air-core coils made from silver/gold wire are made for those audio enthusiasts for whom even the slightest hint of a tiny signal detail is reason enough to spend, without compromise, the necessary for an upgrade. With this coil Mundorf harmonises our silver/gold components – silver/gold speaker cable, silver/gold internal wiring and Supreme silver/gold capacitors – to achieve a homogenous chain of fascinatingly authentic musicality over which the words are silver, however silence remains golden. 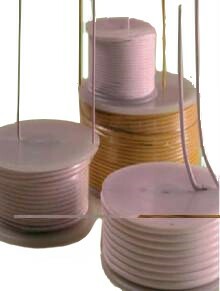 Silver/gold wire is made of pure silver mixed with 1% if high-purity gold. The gold modifi es the crystalline structure of the silver and maximises its very good electrical conductivity.